Magdeburger Joe.com: Vaclav Klaus For President ! Czech President Vaclav Klaus sounded a note of sanity at a UN hearing today on climate change. Of all the skeptics of global warming, Klaus is among the most prominent. Reuters News reports as follows. "Czech President Vaclav Klaus sharply criticized a U.N. meeting on climate change on Tuesday at which U.S. President Barack Obama was among the top speakers, describing it as propagandistic and undignified. "It was sad and it was frustrating," said Klaus, one of the world's most vocal skeptics on the topic of global warming. "It's a propagandistic exercise where 13-year-old girls from some far-away country perform a pre-rehearsed poem," he said. "It's simply not dignified." At the opening of the summit attended by nearly 100 world leaders, 13-year-old Yugratna Srivastava of India told the audience that governments were not doing enough to combat the threat of climate change." Smoke belching countries like China are able to compete with America unencumbered by any laws protecting the environment. Fads such as corn based ethanol drive up the price of corn while proving to be of dubious value as a solution to energy problems. And now we are in the midst of an economic crisis that could cause massive human suffering if the economy were burdened with expensive and scientifically debatable regulations. The Obama administration is recklessly promoting experiments on an economy with human costs that have yet to be measured. When I see Vaclav Klaus and Barack Obama , I see the great president of a small country and the small president of a great country. The G 20 summit is dealing with the subject of globalisation. I suggest that we outsource the job of US President. I'm not talking about cooking up a Hawaiian birth certificate or keeping reporters away from grandma. I'm talking about outsourcing the job altogether. Vaclav Klaus has been involved in the transition to capitalism since communism fell in what was then Czechoslovakia in 1989. I know that we can't swear him in as President, but maybe he could get a job programming Obama's teleprompter. We have doctors and lawyers farming out work to India. Maybe Vaclav Klaus could also write budgets and legislation. Back in 1989, his government took over from communist predecessors. It was a clean beginning. there was no sentimental twaddle about bipartisanship like we got from McCain. If globalisation is good for American workers, let's take it up the line. Let high executives have to worry about losing their jobs to somebody in India who's getting $200.00 a week to send in work over his fiber optic connection. If Barack Obama is so much in favour of globalisation, let's farm out some of his work. The Czech Republic has been making a lot of progress since 1989. They are well educated and have lower wages, which makes them very competitive in Europe. They like America a lot better than most of Obama's advisers, and they want capitalism to succeed. It sounds like a good deal. Instead of being a puppet of some radical buddies from his college days, Obama can be a puppet of someone who is good for the country. Writing legislation should be no problem. We have no less an authority than Ruth Bader Ginsburg telling us that the US Supreme Court should consider opinions from European courts. So what are we waiting for ? When you pay your credit card bill, you never know if you will be speaking to an American or someone from overseas. Soon that may happen when you call the White House. 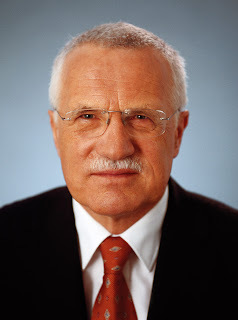 I'd love to see Vaclav Klaus as President of the US, but I can't find his Hawaiian birth certificate. It would be a lot easier if he just got the password to Obama's teleprompter. Hey. If outsourcing is so great, let's take it to the top.